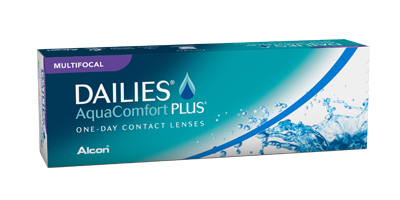 DAILIES AquaComfortPlus Multifocal Contact Lenses are designed to keep your eyes healthy and hydrated all day long with every blink-no matter what the day may carry. This new technology has 3X MORE MOISTURIZING AGENTS RELEASED. .Blink-activated moisture technology for outstanding comfort throughout the day. .Designed for clarity at all distances, near through far. 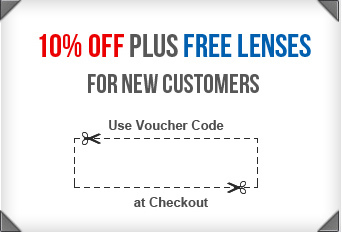 This multifocal lens is perfect for those people who have presbyopia (failure to focus on near objects who may currently use reading glasses) and aren’t currently wearing contact lenses or are unhappy with their current contact lenses.These lenses are agreat alternative to varifocal glasses because they are specially constructed for those who require different prescriptions for far and near distance. 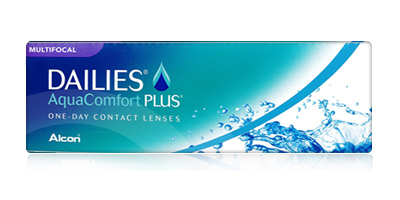 Place an order for Dailies AquaComfortplus Multifocal lenses with us and get fast delivery to your doorstep.